Volkswagen Ireland has revealed a new, additional version of the e-Golf - the 'Executive Edition', with the company stating that the car is aimed at those private or business buyers that want the ultimate e-Golf. It is priced from priced from €39,495 after the applicable VRT Rebate and SEAI grants have been applied. In addition to the already well appointed e-Golf, the 'Executive Edition' adds 17-inch ‘Madrid’ alloy wheels, LED tail lights with running indications, a full leather interior with Sports comfort seats in front, Active Info Display, Rear-View Camera, Heated Front Seats, Tinted Rear Windows and Keyless Access. The added equipment adds up to a total of €4,700 but this is discounted to €3,500 in addition to the standard e-Golf. It should be noted that Volkswagen estimates that the 17-inch wheels will reduce the range under WLTP by 13km. WLTP range of e-Golf is 230km, so the WLTP range of e-Golf 'Executive Edition' is 217km (Combined Cycle ). 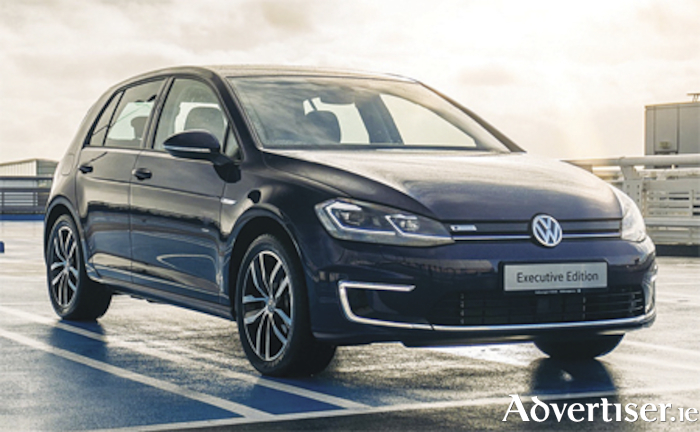 The e-Golf 'Executive Edition', (€49,495 before any grants are applied ) can avail of a range of incentives including zero per cent Benefit in Kind, which is capped at €50,000 OMV and 100 percent accelerated capital allowance of up to €24,000. This for cars coming under the category 'Electric and Alternative Fuel Vehicles', the accelerated allowance is based on the lower of the actual cost of the vehicle or €24,000. Volkswagen Ireland claims this makes the car an ideal solution for business customers wishing to start their electro-mobility journey and avail of significantly reduced running costs compared to petrol or diesel models. There is also the benefit of reduced toll fees, free public charging and in the case of some local authorities, free parking when charging. Contact one of Michael Moore's sales team on (090 ) 6403444 or visit www.michaelmooreathlonevw.ie for more details on the Volkswagen range.